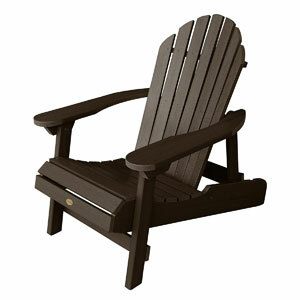 The Adirondack chair was invented in the early 1900s by Thomas Lee. This popular chair has been a consumer favorite since it was presented to the public and is routinely seen on decks, front porches, patios, and poolside in homes all over the world. What is the Best Adirondack Chair Material? What is the Right Size Chair for Your Needs? 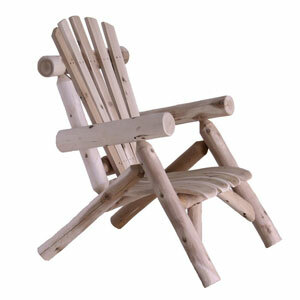 The original name of the Adirondack chair was the Westport chair. The design went through some changes in 1938 when Irving Wolpin redesigned the style to have the well-known contoured seat and back that makes it one of the most comfortable chairs to sit in. There are tons of options that you can choose from when it comes to Adirondack chairs. The materials used to make them, the color choices available, and other design choices make finding the right one quite a challenge. These five reviews and the buying guide will help you learn more about this popular chair so you can sort through all the choices and options and make the right choice for your preferences and needs. You’ll be able to create the outdoor recreation area you’ve always wanted with Lifetime Adirondack Chairs. One of these amazing chairs won’t do, you’ll find yourself having to purchase many more because everyone will want to sit in this one. This comfortable chair is made from Polystyrene that is UV-protected. This material is weather-resistant in all kinds of weather and very durable so it will last a long time. The slats allow water to drain right off so you won’t sit down accidentally in a puddle of standing water left in your chair after a rain. 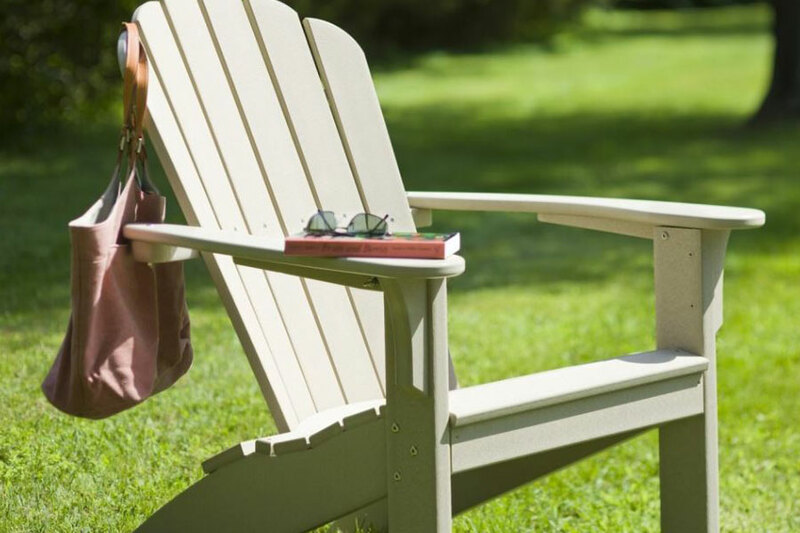 There is no worry about chipping, peeling, cracking, or rusting with the Lifetime Adirondack Chair. It looks just like beautiful wood without the upkeep. The design is super comfortable and fits well with any outdoor space. Cleaning these chairs is easy as well. Hose them off or use a rag and some mild soap to keep them looking as good as new. There is some quick and easy assembly required to put the chair together. These chairs are perfect for back decks, front porches, the pool area, or patio. It is the perfect place to relax after a long day and enjoy the outdoors in comfort. Lifetime Products offers consumers a 2 year limited warranty on this chair. 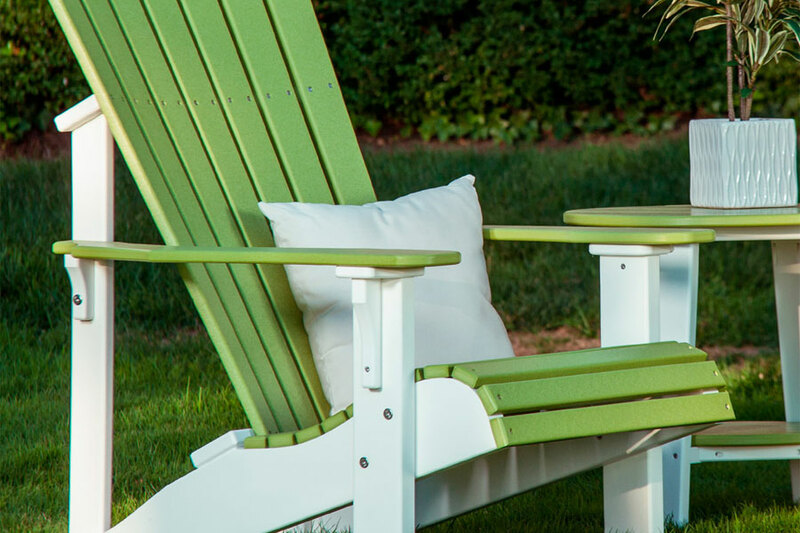 Highland Hamilton Adirondack chairs are made in the USA from eco-friendly, recycled plastic and other proprietary materials. The curved back offers plenty of comfort while the convenient fold feature makes it very easy to store. A customer favorite feature is the reclining option that allows users to adjust the back of the chair to their own preferences. The Highland Hamilton is made from fade resistant recycled plastic that is also eco-friendly. The hardware used in construction is made from 304 grade stainless steel. This low-maintenance hardware enables these chairs to be outdoors all year round without the hardware rusting. The company offers a manufacturer’s warranty of 12 years for residential use and 2 years commercial. 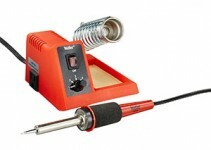 There is some light assembly required but it is nothing overly complicated or time consuming. This beautiful Adirondack style chair from Lakeland Mills is made from weather and insect resistant white cedar that will look beautiful in any outdoor living space. The curved seat slats provide the user with plenty of comfort. Assembly is required but it is not overly complicated and can be done in a short amount of time. This rustic beauty is perfect for the front porch, back deck, or patio of any log home or home that has rustic appeal. The Lakeland Mills Cedar Log Lounge chair is made in the USA and makes a great gift item as well. POLYWOOD’s classic folding Adirondack chair is made to withstand extreme weather including snowy winters, heavy rain storms, strong winds, and hot sun without losing its beauty or strength. It is made from HDPE material that features UV protectant throughout. The deep contoured seat is so comfortable your friends and family will be fighting to sit in it. POLYWOOD Adirondack chairs fold up making storage convenient and travel super easy. Bring it camping, to outdoor picnics, and even the park. You’ll find clean up easy as well, just clean it with soap and water and you’re done. The Marine-grade stainless steel hardware is rust resistant and allows the chair to be kept outside all year long without problems. This low maintenance, stylish Adirondack chair requires little to no maintenance and won’t chip, splinter, rot, peel or need staining or waterproofing. 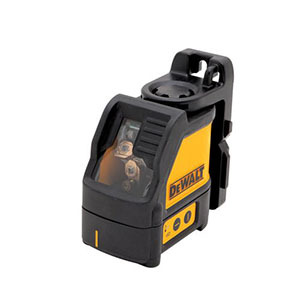 It is resistant to stains and corrosive substances and comes with a 20-year residential warranty. There are 13 colors to choose from guaranteeing you’ll find something to go with your outdoor living space décor perfectly. Trex Cape Cod Adirondack chairs are the perfect outdoor chairs for your front porch, patio, back deck, or pool area. The beautiful look and comfortable design is so appealing that people will fight to sit in them so make sure you have more than one. Genuine stainless steel hardware is used in construction for the maximum in durability, rust-resistance, and longevity. These USA made chairs require no staining, sealing, or painting and can be kept outdoors all year round while maintaining its great appearance. These chairs require very little assembling; some models come right out of the box already assembled and just need to be unfolded and they’re ready to use. Those that do need assembling will only need basic tools and takes less than 30 minutes to put together. This buying guide is filled with information on the different options that you will have when researching different Adirondack chairs. 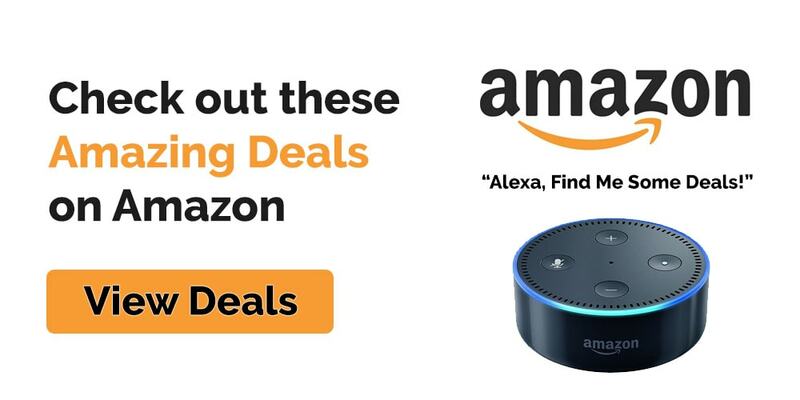 We have made the buying process much easier by providing you with these different options and educating you on the different features available. Adirondacks have a distinct and easily recognizable design that includes a reclined chair with a seat that slopes backwards and sits close to the ground. This style is made to relax into. The wide arms are perfect for gripping to get out of the chair as well as resting your arms on or placing a drink on for your convenience. Some styles even have drink cut-outs where a drink can be placed inside it. Below, we have listed some of the more common benefits that users will find when they purchase an Adirondack chair. Each material has its benefits and drawbacks. Before you purchase a chair it is a good idea to figure out exactly what your needs and preferences are so you choose the right style, material, and design for your yard. How durable is the chair? Will it last outdoors all year round or need to be brought inside during extreme weather and temperatures? How easy is the chair to maintain? Does it require staining? Is it easy to keep clean? Does it have to be re-painted? How will the chair look after a few years? Is the material resistant to mildew, peeling, chipping, or other problems that can make it look terrible? Does the design of the chair match your outdoor living space? How easy is the chair to move around? Is it foldable for convenient travel and storage if necessary? Is the chair easy to move around or does it weigh a ton? Is the chair a good value? There are several different types of materials used in the construction of Adirondack chairs. Teak – This is an excellent choice for outdoor furniture. It is very resilient and durable and isn’t easy to scratch or dent. Teak produces its own oil which acts as a protectant. It’s resistant to water, wind, rust, and sun and is just fine staying outdoors all year round. It can be more expensive than other materials. Teak is only available in its natural color but that typically looks great with any kind of outdoor décor. 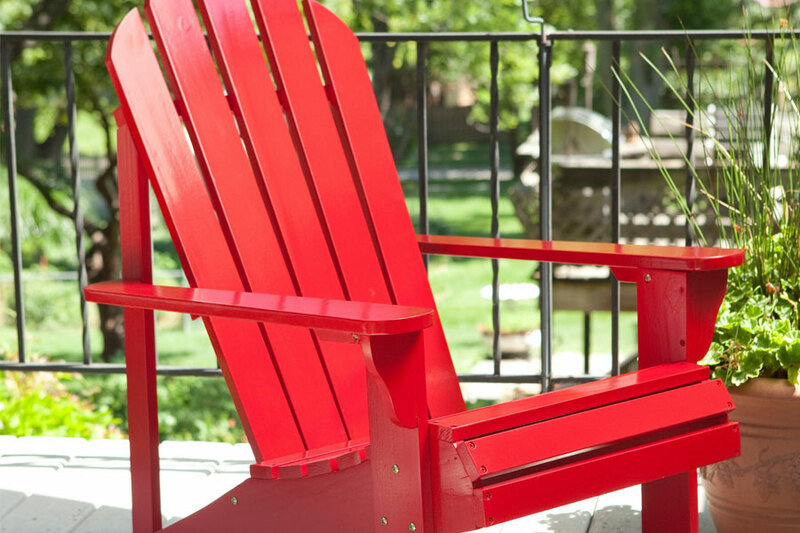 Aluminum – This type of material isn’t as popular as the others but it is possible to get an Adirondack chair out of aluminum. It is very lightweight, tough, and easy to maintain. Aluminum chairs can be left outside all year round. It is 100% resistant to rust and water. 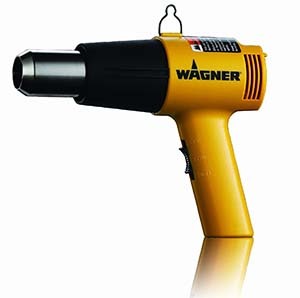 While it isn’t as comfortable as some of the other types, it is less expensive than other the choice. On a down side, aluminum chairs are not going to be as comfortable as other styles and materials, but some people prefer them. 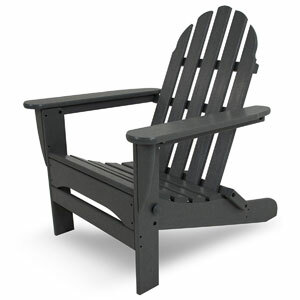 HDPE – This material, High-Density Polyethylene is often used to create Adirondack chairs. HDPE is synthetic resin. It makes durable, long lasting, solid furniture. HDPE is very easy to maintain; all you need is soap and a rag. HDPE Adirondack chairs can stay outside all year round without problems. These chairs are long lasting and resistant to wind, rust, and water. This material is made from recycled milk jugs and is totally made from recycled products. Another benefit to HDPE is that it is available in a variety of colors. This is one of the most inexpensive options on the market for Adirondack chairs. Plastic – Plastic will be the cheapest material used for construction but it also tends to be the weakest and can break easily. If you want to have the chairs around for a long time, it is better to choose more durable materials. Adirondack chairs come in a variety of widths and sizes. Choose the right sizes for the people who will be sitting in the chairs most often. The majority of chairs will usually measure from 36” to 42” tall. The seats will typically be 30” to 34” wide and anywhere from 35” to 38” deep. Most chairs weigh from 15 pounds to 45 pounds depending on the materials that the chair is made from. Solid wood Adirondack chairs will weigh a lot more than those made from HDPE lumber. Make sure that you have plenty of space between and in front of your chairs so users can sit down and stand up comfortably without crowding anyone else. Be mindful of the height of the chairs you choose. If the majority of people who will be using the chairs are on the shorter side, look for seats that are lower to the ground or about 14 inches off the ground Tall people will be a lot more comfortable in taller chairs about 16” off the ground or higher and won’t feel like they have their knees up in front of their faces. 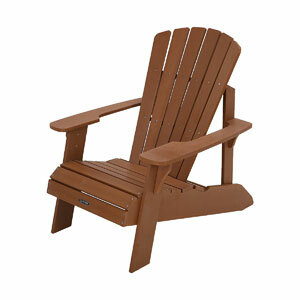 There are several styles of Adirondack chair to choose from. The basic style is pretty standard and hasn’t changed very much over the years but there have been some manufacturers that have added twists and design tweaks to the standard design that may appeal to you. 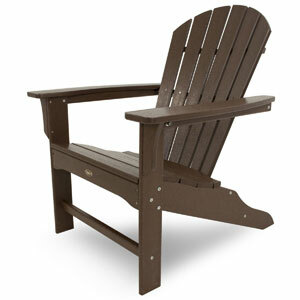 Classic Style – This style is the basic, commonly seen Adirondack chair with the reclined back and sloping seat. Oversized – This is exactly what it sounds like; an Adirondack chair that is larger than the basic style is great for taller or larger adults. South Beach – This style is taller than the others and has a wider frame and oversized arm rests. Seashell – The waterfall seat this design has is very elegant and features slats that continue down the front part of the chair. Modern – The seats on a modern Adirondack chair have a straight back that look great with other modern décor. Folding – Many Adirondack chairs feature a folding ability that allow it to be stored easily or taken on camping trips easily. Adirondack chairs continue to be popular thanks to their style, design, and comfort. They look good with every kind of décor and make super comfortable seats to sit in during gatherings, cookouts, and just while relaxing by the pool or on the porch reading a book. The information in this guide has been provided to help you understand the different features Adirondack chairs offer and how you can find the perfect one for your needs.